Remember all that talk of U.S. stimulus measures? Today is the day that the Federal Reserve is expected to close off its stimulus program. That's kind of like taking off the training wheels and letting the U.S. economy ride along on its own. 1. The end of stimulus: The Fed is expected to announce the conclusion of its massive stimulus program this afternoon. The quantitative easing program, which lasted for six years, is widely credited with supporting the economy and driving investors back into stocks in the aftermath of the financial crisis. In addition to the expected stimulus announcement, the Fed is also set to give more details about plans for interest rates at 2 p.m. ET. Most investors believe the first rate hike won't occur before June 2015, and many are betting it won't happen until the end of next year or later. Any surprise announcements could have a big impact on trading. 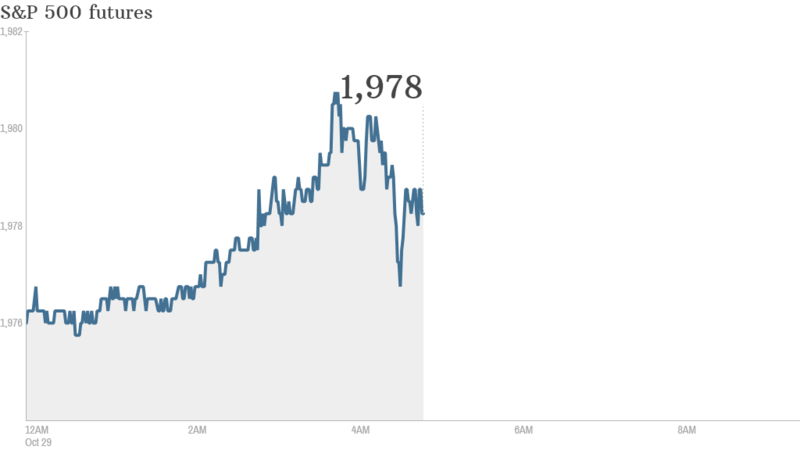 U.S. stock futures were relatively flat ahead of the major Fed announcements. 2. Facebook flop: Shares in Facebook (FB) are off by about 7% premarket after executives revealed plans to ramp up spending next year. Expenses in 2015 are expected to rise by as much as 75% versus the current year, which is irking investors. Premarket data shows Facebook's fall is dragging down the Nasdaq. 3. Earnings: Hershey (HSY), Hyatt Hotels (H) and SodaStream (SODA) are among the key companies reporting quarterly results before the opening bell. Visa (V), Baidu (BIDU), Weight Watchers (WTW) and Kraft Foods (KRFT) will report after the close. 4. Russia-Ukraine gas talks: Investors are keeping a close eye on Russia-Ukraine energy negotiations. Russian Energy Minister Alexander Novak and Ukrainian Energy Minister Yurii Prodan will attempt to hash out a temporary contract for Russia to deliver gas to Ukraine over the winter. This is a contentious matter since Russia completely cut off gas supplies to Ukraine a few months ago. 5. International markets overview: Major European markets are edging up in early trading. Shares in the healthcare firm Sanofi (SNY) were dropping by about 4% in Paris after the company announced it was booting out its CEO, Christopher Viehbacher. Asian markets mostly ended with gains. The Shanghai Composite index led the pack with a 1.5% jump. 6. Tuesday market recap: U.S. stocks closed higher at the close of the previous trading session. The Dow Jones industrial average gained 188 points, nearly erasing its October losses. The S&P 500 closed 1.2% higher and the Nasdaq was up 1.8%.